STUDY | The homeowners consider the study the “adult family room” because of its proximity to the bar, Knauss says. “The acid yellow walls are a surprising touch against the darker, more sedate traditional wood of the surround.” The table lamp at left is vintage, most likely from the 1950s. 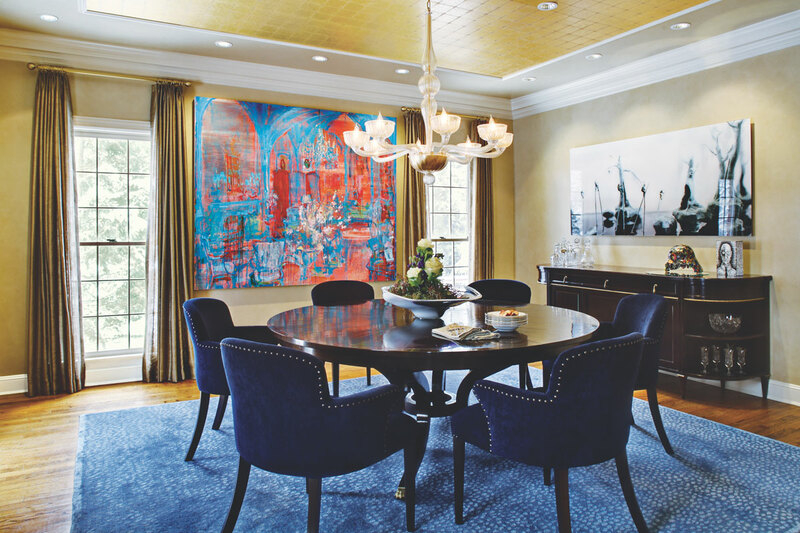 In the dining room, “we kept the window treatments a pale gold to work with the wall color,” Knauss says. Sheer bronze curtains on brass hardware complement the goldleaf on the ceiling. The furniture is traditional, but not overly so. The art in this room “is a little bit more edgy, so it’s a balance,” the homeowner says. SON’S BEDROOM | A gold, blue and orange color scheme prevails in a son’s room, at his request. As he grows, there’s space to replace the twin bed with a queen bed. Accessories spray-painted gold adorn the shelves. Given a blank canvas, a designer takes inspiration from her clients’ art collection. That’s particularly true in the dining room—a museum piece in many households, but a space that’s warm and welcoming here. “In my dining room, every chair is completely cushioned and comfortable.” That comfort didn’t come at the expense of style. A neutral wall color offsets the deep blue carpet and chairs. Overhead, a gold ceiling offers a striking optical illusion. Knauss also added a piece of trim around a goldleaf square. “It’s actually in the same ceiling plane.” The recessed effect defines the center of the room, drawing focus to the round table and the Venetian chandelier. The living room—another room that’s often treated as a “hands-off” space—is eminently livable, thanks to an outside-the-box plan. “We put a pool table smack in the middle,” the wife says, adding, “A pool table invites you in.” Indeed, her 80-year-old stepfather and 12-year-old son enjoy spending time together here. Knauss ensured that such get-togethers can be relaxed: “In the living room, children interact with adults and food is allowed.” The designer chose fabrics and finishes accordingly. “The chairs are upholstered in an easy-to-clean chocolate Ultrasuede, and the sofa is covered in commercial-grade cotton velvet that naturally keeps spills on the surface,” she says. The kitchen is highly practical as well, with the same relaxed vibe. Storage space is maximized in the large island and the perimeter cabinetry. And Knauss proved she understands the frustration of millions by designing customized space for reusable water bottles. 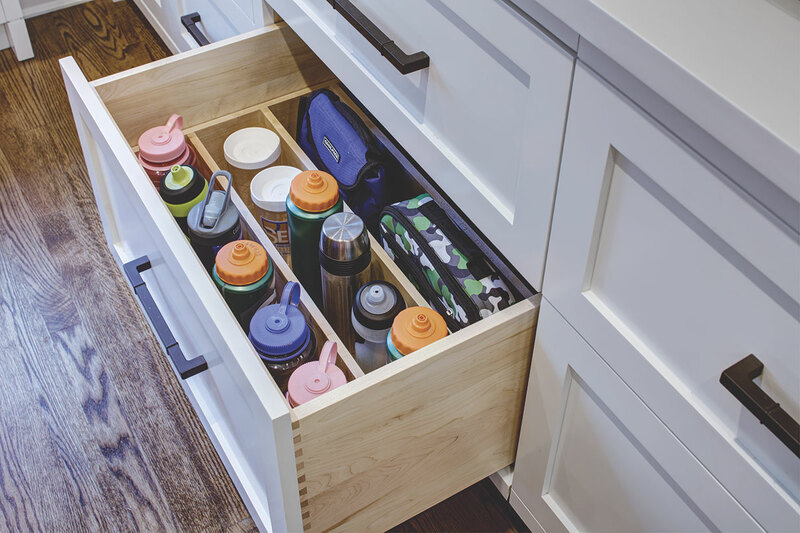 To keep the bottles—which she says “are chaos every time you open a cabinet”—at bay, she simply added dividers to a deep drawer. Now they’re organized, handy and chaos-free. The window seat plus the warm tones of the walnut island and table make this room hospitable. 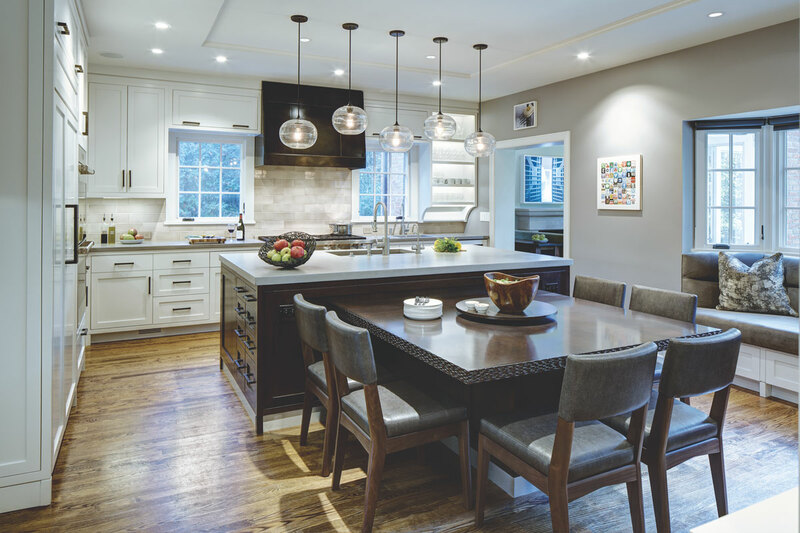 The transitional elements, such as pendant lights over the island and a rolled-steel range hood add a bit of edge. A hand-lacquered finish gives the hood a bronze-like patina, Knauss says. “It’s a work of art,” the wife adds. While the designer didn’t design the room settings for the art, she used the art as inspiration. “The space had to be neutral enough to support it,” she says. Neutral enough—but not completely colorless. Acid yellow walls in the study pack an unexpected punch alongside the dark wood of the cabinetry and coffered ceiling. The family room has an airier ambience with light green walls on a soaring peaked ceiling. When one of the children “decided he wanted a gold room with blue and orange accents,” Knauss obliged, setting the deep tones against white built-in cabinetry and trim so the colors pop. That son’s confident decision-making skills will come in handy when he turns 16 and gets to choose a piece of art for his room—a rite of passage for each of the children. Overall: design, KBK Design in Westfield. Family Room: sofas, Manzanares Furniture Corp. in Long Island City, New York, with fabric from Rogers & Goffigon and Carleton V Ltd.; chair and ottoman, Edward Ferrel-Lewis Mittman in New York City with fabric from Lee Jofa; orchid print throw pillows, Jerry Pair in New York City; marigold/green linen throw pillows, Rogers & Goffigon; lamps, Vaughan Designs in New York City; coffee table, The Sterling Collection Inc. in San Fernando, California; carpet, Major Mills in Clark; window treatments, fabricated by Workroom Services in Warren with fabric from Coraggio Textiles; wall color, Fernwood Green by Benjamin Moore; trim color, White Dove by Benjamin Moore. Study: leather chairs, Edward Ferrell-Lewis Mittman with leather from Spinneybeck; throw pillows on leather chairs, fabricated by Reimer’s Custom Workroom in New Holland, Pennsylvania, with fabric from the Travers Collection by Zimmer+Rohde and by Rose Tarlow; side table next to leather chair, Country House Antiques (now out of business); side table next to sofa, Baker Knapp & Tubbs; coffee table, Knollwood Antiques in New York City; carpet, Patterson Flynn Martin in New York City (T); lamp next to sofa, Linda Elmore Antiques in Westfield; floor lamp next to leather chair, Visual Comfort & Co. through Heritage Lighting in Lambertville; window treatments, fabricated by Workroom Services with Travers Collection fabric by Zimmer+Rohde. Living Room/Billiard Room: pool table, Blatt Billiards in Wood- Ridge; carpet, Odegard in New York City; light over pool table, Linda Elmore Antiques; window treatments, fabricated by Workroom Services with fabric from Stroheim; window treatment hardware, Fabricant in Harrogate, England; sofa, Michael Berman Ltd. through Profiles in New York City (T); Beatrice armless chairs, Madeline Stuart through Profiles; Tuileries wing chairs, Baker Furniture; marble fireplace mantel, designed by KBK Interior Design and fab­ricated by Bridgewater Marble & Granite in Bound Brook; wall color, Challah by C2 Paint; trim color, Timid White by Benjamin Moore. Dining Room: table, Jerry Pair through Dessin Fournir in New York City; chairs, Profiles with Manuel Canovas fabric from Cowtan & Tout (T); Balestra chandelier, Gary Gandelman Antiques in Princeton; goldleaf wall covering on ceiling, Phillip Jeffries Ltd. (T) in Fairfield; window treatment, fabricated by Workroom Services Inc. with fabric from the Travers Collection by Zimmer + Rohde; window treatment hardware, Stroheim; console, Baker Knapp & Tubbs; wall color, Sandcastle by C2 Paint with custom glaze; trim color, Bone White by Benjamin Moore. Kitchen: cabinets and table, R&G Construction Cabinet and Millwork Inc. in North Plainfield; cabinets lacquered in Classic Gray by Benjamin Moore; drawer pulls, RK International through Hardware Designs Inc. in Fairfield; faucets, Waterstone Faucets through The Bath Connection in Fanwood (now out of business); sinks, Blanco America Inc. in Lumberton through The Bath Connection; hand-blown glass pendant lights, John Pomp through A. Rudin in New York City; range hood fabrication, Dale Johnson of Old World Stone Carving in Sunbury, Ohio; chairs, Altura Furniture through Dennis Miller Associates in New York City (T); backsplash tile, Mediterranean Tile in Fairfield; countertops, Trueform Concrete in Wharton; range, ovens, microwave and wine refrigerator, SubZero-Wolf Appliances in Pine Brook; window seat cushion, Master’s Interiors in Clifton with fabric from Holly Hunt in New York City; throw pillow on window seat, Reimer’s Custom Workroom with fabric from Lee Jofa; wall color, Fusion by Benjamin Moore; trim/ceiling color, Classic Gray by Benjamin Moore. Child’s Room: window treatments and headboard, fabricated by Workroom Services with fabrics from KnollTextiles and Norbar Fabrics Co. Inc.; wall covering, Innovations in New York City; sheepskin throw and pillows, Auskin in Arvada, Colorado; other pillows, fabricated by Reimer’s Custom Workroom with fabric from KnollTextiles and Norbar Fabrics; cabinetry for bed and shelves, R&G Construction Cabinet and Millwork Inc.; cabinet knobs, Colonial Bronze Co. through The Bath Connection; cabinet knobs, RK International through Hardware Designs Inc.; carpet, Major Mills; white table, West Elm; sconces, Robert Abbey Inc. through West Essex Lighting Studio in West Caldwell; paint, Tyler Taupe on the walls, Natural Wicker trim and White Dove on the ceiling, all by Benjamin Moore. T=To the trade.